Apparel Sourcing Paris is a renowned international trade fair which provides a platform for buyers and sellers to locate and meet reliable apparel suppliers for sleepwear, nightwear, socks, home footwear, robes, pyjamas, casualwear and sportswear. This is a show that you should not miss. You can meet with vendors from many different countries under one roof. Your sourcing network can expand quickly and effectively with the contacts you make here. Apparel Sourcing Paris is organised by the Messe Frankfurt Paris office. Founded in 2002 with the aim of holding trade fairs in France. In order to respond to the demands of buyers and supplier in the apparel field and to promote clothing and garment manufacturers as a whole, the Apparel Sourcing show commenced September 2011 at Paris Le Bourget exhibition centre. The upcoming show this February is one of 2 shows that take place during the year. It remains a leading European sourcing trade fair. The show provides a platform for both buyers and sellers to meet and communicate with each other. Exhibitors at the show are from different parts of the world, and are reviewed by a selection committee. This sourcing platform provides an open, and large networking opportunity for participants. Not only can you explore a wide variety of collections of apparel and find the best solutions in fashion and fashion accessories sourcing, you can also build relationship with renowned manufacturers in the field from around the world. The show includes manufacturers and suppliers who showcase a wide variety of textiles, apparel and fashion accessories. This event will provide the opportunity to meet and network from basic to high end, textiles, apparel and fashion accessories for men, women, boys and girls. 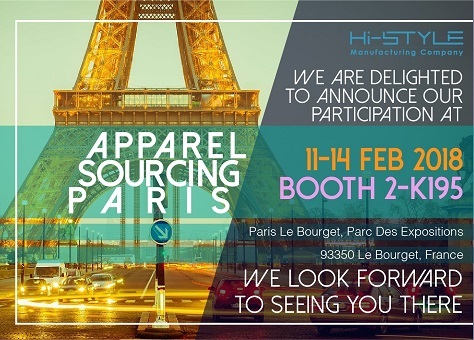 Apparel Sourcing Paris will be held from February 11th to February 14th, 2018 and is a 4 day event in Le Bourget, France. For the first three days, the show is open from 9 a.m. to 6 p.m. On the last day, it will be open from 9 a.m. to 4.30 p.m. Access to the fair is for the trade visitors. http://texworld0218.site.calypso-event.net/visiteur/coordonnees.htm which is free of charge. Hi-Style Manufacturing Company which is a clothing manufacturer headquartered in Hong Kong with production capabilities in China will have the booth there. We are there to showcase our company’s products including sleepwear – robes, pyjamas, jumpsuits; sportswear; loungewear; casual wear; socks; home footwear; blankets; throws and fashion accessories. Come visit us at booth 2-K195 and tell us your manufacturing requirements. You will not be disappointed with the range of product we will have on display. Look forward to seeing you there.